Prosperity Wealth is delighted to announce that a new Birmingham city centre development will be launched later this month. The success of Birmingham as a property investors hotspot continues with vigour. Click here to read why. Following a number of developments in the city, Prosperity is about to launch this exclusive residential offering in the heart of Birmingham. This amazing development will comprise of 165 luxury one, two and three bedroom apartments. 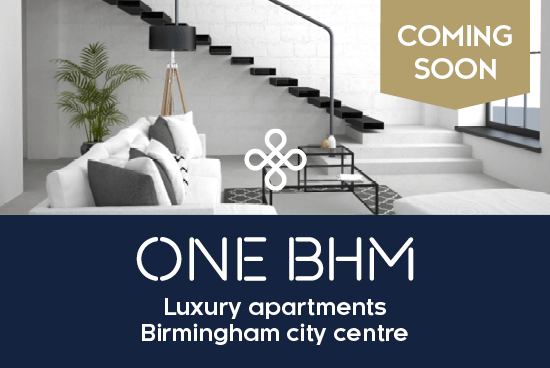 With its much sought after B1 postcode, One BHM will appeal to young professionals looking to rent close to all the major business, retail and entertainment venues that Birmingham has to offer. One BHM is also on a walking distance to Arena Central where the new HSBC headquarters will be located, Brindleyplace where Deutsche Bank is located and close to Paradise – Birmingham’s latest regeneration project. The apartment interiors will be designed to a high design specification using Prosperity’s Signature Living range. Prices for a one bedroom apartment start from £164,995. You can pre-register your interest and be one of the first to reserve your plot HERE.